Julie Anne San Jose 'Hologram' concert is taking place already this coming Saturday, December 13, 2014, 8PM, at the Mall of Asia Arena (MOA). I think you shouldn't miss this holographic concert experience with the Asia's Pop Sweetheart Julie Anne San Jose. It's gonna be sooo exciting to catch her in amazing holographic performances. A first in the country! Asia's Pop Sweetheart Julie Anne San Jose conquers the SM Mall of Asia Arena on December 13, 2014 (12.13.14) as she stages the first ever hologram concert in the Philippines. In her concert dubbed as Hologram, the multi-platinum recording artist is set to bring the house down with her powerful vocals, electrifying dance moves and undeniable talent in playing various musical instruments simultaneously using the hologram technology. The concert will be highlighted by an extravagant display of visual effects that will surely elevate the Philippine concert experience. "Very proud po ako sa upcoming concert na 'to. Aside from the technological advancements, inaasikaso rin namin ang iba pang mga detalye ng show na talaga namang dapat nilang abangan sa December," shares Julie Anne. Aside from getting involved in conceptualizing production numbers of her show, the Kapuso star is also preparing herself for her biggest concert yet. "Marami pa akong gustong ipakita sa fans ko na kaya kong gawin, at the same time, very passionate talaga ako sa ginagawa ko," she adds. Joining her are some of the country's best male performers: Asia's Romantic Balladeer Christian Bautista, Youtube sensation Abra, Kapamilya star Sam Concepcion, and other surprise guests that will make the night even more memorable. Julie Anne has come a long way since her career was launched in Popstar Kids, the singing competition which aired on the former GMA QTVin 2008. 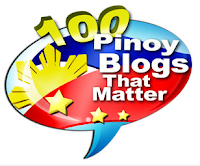 Since then, Julie Anne has appeared in numerous TV series, variety shows, and films. She also lent her voice to several theme songs for the programs and specials of the Network. 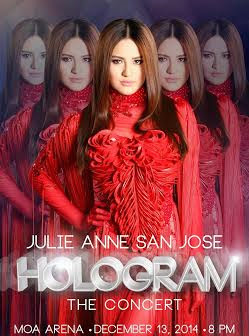 Hologram is produced by Tarroza Entertainment Productions.